Street view of P.S. 31 in the Bronx, NY. Image credit: Google. Landmarks urged DOB and DCAS to look at all possible alternatives before resorting to demolition. 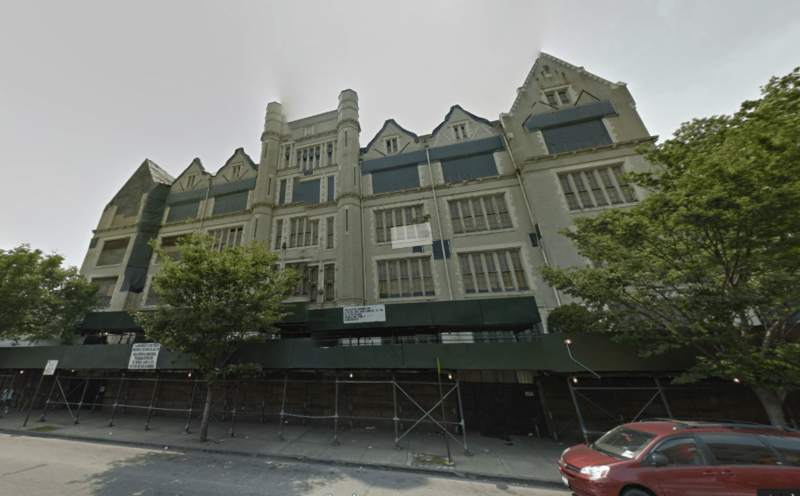 On December 17, 2013, the Landmarks Preservation Commission held a hearing for the application for an advisory report to demolish the individually landmarked Public School 31, located at 425 Grand Concourse in the Bronx. The Collegiate Gothic-style building was designed by C.B.J. Snyder and is currently owned by the Department of Citywide Administrative Services, which assumed possession of the building from the Department of Education in 2011. The school has been vacant since 1997. DCAS’s Jerome White testified that an emergency declaration had been issued for the building’s demolition in November 2013. White said numerous efforts had been made throughout the years to address the deterioration of the building, but the condition of the building made rehabilitation prohibitively expensive. In 2012, Hurricane Sandy destroyed many of the building’s existing protective measures and aggravated already-severe water damage. Though there had been interest in redeveloping the school as affordable housing, it would be impracticable and financially infeasible to convert and salvage the structure. Tim Lynch, DOB’ Acting Assistant Commissioner for Investigative Engineering Services, testified that DOB had been monitoring the school for years as an actively unsafe structure. He said the building represented a threat to pedestrians and, even though the building is surrounded by a sidewalk shed, during Sandy a portion of the parapet wall fell off the building and onto a playground. The building, with corroded structural wrought-iron beams and columns and unsafe walls on the interior and exterior, was not stable and severely damaged. Lynch said the determination that the building required demolition was not a unilateral decision made lightly, and that the building’s instability would make it a dangerous site for workers if efforts were made to repair it. Several community members attended the hearing to speak against the demolition. Eduardo Garcia called the school a “beloved building in the community” and asked, “why was this building left to rot for 17 years?” A former student of the school said the building was a beacon to alumni who credited it “for allowing us to be able to go to college, and come back to the neighborhood after.” Another resident stated that he did not believe that the destruction of an individual landmark would be permitted in any other City neighborhood. Phillip Morrow of SoBro, the South Bronx Overall Economic Development Corporation, said the organization believed the building could be saved, and had presented a plan to HPD for its redevelopment, but had been rebuffed. Morrow compared the building to P.S. 109, which had been in even worse condition, but successfully rehabilitated to become a community asset. Preservationist organizations, the Historic Districts Council, the New York Landmarks Conservancy, and the Society for the Architecture of the City also opposed the demolition. Landmarks Chair Robert B. Tierney stated that Bronx Community Board 1 issued a resolution opposing the demolition, but recommended uses for the site, including affordable housing, if the building were destroyed. Ted Weinstein of HPD responded to the SoBro testimony by stating that redevelopment was not financially and physically practical. Weinstein stated that before any plan could be approved. it would have to go through a competitive bid process and rezoning through ULURP, during which time the structure would continue to degrade. Landmarks General Counsel Mark Silberman clarified that the Commission’s advisory report would be non-binding, and that the building could be destroyed even if Landmarks disapproved. Silberman added that demolition would not automatically revoke the site’s designation status, and that, in the past, the Commission voted to rescind the landmarking of destroyed structures. Chair Tierney said he did not see any solutions to the “distressing” situation, and that he would defer to Building’s expertise in remedying an “imminent threat to public safety.” Commissioner Libby Ryan decried the “disgraceful stewardship” of DOE, and said she could not condone the building’s demolition. Commissioner Michael Devonshire stated that he gave the highest credence to Tim Lynch’s testimony, but said he would vote against demolition in hopes the building would be given “one last chance.” Commissioner Michael Goldblum asserted that “we sit as part of a system that has failed this community and failed this building.” Commissioner Margery Perlmutter said Landmarks should plead with other City agencies to find ways to accelerate the slow bureaucratic processes that prevented the adaptive reuse of the building. Chair Tierney said that, though the Commission could not mandate that the building not be demolished, it would issue a negative advisory report on the application. He asked the applicants to take into account the public testimony and Commissioner comments and take a “second look” at the building’s potential retention. LPC: Public School 31, 425 Grand Concourse, Bronx (15-0779) (Dec. 17, 2013). Where is Jose Serrano? The man who has represented this area for the last 38 years, first in State office and now at the Federal level has no opinion or statement reflected in this report. This happened and was allowed to happen under his watch. If he accepts the rewards for public office, he should also welcome the blame for allowing this situation to proceed to the point where we may now have no choice but to lose a landmark of the South Bronx.